Researchers at the University of Pennsylvania have designed a new adaptable robot capable of flying, walking or using of combination of those skills at once, much like the movements of a large, winged insect. In the future, swarms of these robots may be employed to build intricate engineering projects. 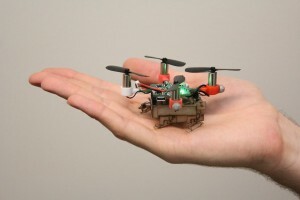 Dubbed the “Picobug” and inspired by a male stag beetle, the compact, 30-gram robot combines the flight of a Dragonfly quadrotor and the crawl of a DASH robot that allows multiple modes of locomotion. It can fly up to 13 miles per hour and skitter across a 10-foot-long table in 19 seconds. The university’s GRASP Laboratory released footage of the little robot scuttling across a flat surface, flying over a cinder block, and traveling through tight spaces by flying and crawling simultaneously. Video by PBS NewsHour, footage provided by the University of Pennsylvania’s GRASP Laboratory. The robot could be used to explore nuclear reactors or similar facilities where the Picobug would be better able to navigate through any air ducts, holes, or any other confined spaces, Mulgaonkar told Spectrum. Mulgaonkar told the NewsHour the robot can be assembled cheaply, so there’s no need to worry about the robot coming back safely from its mission, as long as the robots deployed some cameras or audio sensors, or beamed back a couple of surveillance pics in time, he added. Researchers also said they’re still working on equipping the Picobug with a gripper, not only to make it easier to latch onto small objects, but to other Picobugs. If Picobugs grabbed ahold of each other, it wouldn’t be too dissimilar to a swarm of fire ants forming a bridge. That way, the robots would be able to carry heavier payloads or collectively build a nest, Mulgaonkar said. Researchers will present their paper on the Picobug in May at the IEEE International Conference on Robotics and Automation in Stockholm.